﻿ Interesting Facts About Opium Poppy, Papaver somniferum. Flower, Food, or Drug? You Decide. New research began January 1, 2010 with fungal agents being tested as herbicides to control illegal growth of narcotic plants, such as Papaver somniferum. These fungal agents attempt to control unwanted growth with necrosis. The effects of this treatment can begin to be seen within 48 hours. Papaver somniferum has been known for centuries to produce alkaloids that can be used for pain treatment, and Opium Poppy can produce up to 80 of these different alkaloids. Latex is harvested from Papaver somniferum by creating a small cut along the pod of an opium plant and collecting the liquid latex secreted by the organism. This liquid must be dried and processed to be used for medicinal products. Medicinal Marijuana (Cannabis sativa X indica) is another plant that has many medical uses, but also is often illegally misused. Another Individual from my Biology 203 class has created a webpage on this organism. Opium seeds are often used as ingredients for food. Mythbusters, a television program, dedicated to confirming myths with science, confirmed that it is possible to test positive for heroine or opium if an individual has recently consumed products associated with opium, such as poppy seed muffins. Opium plants are grown for their decorative nature due to the beautiful red, white, pink and purple flowers produced. According to a study done in 1999, Iran is the country with the most illegal opium related problems, with 2.8% of the population between 15 and 64 years of age having problems. Opium has been referenced occasionally in movies throughout history, but possibly the most famous instance was in The Wonderful Wizard of Oz. Opium plants were used by the Wicked Witch to put Dorothy and her friends to sleep before they reached the Emerald City. The United States as well as NATO were forced to face a difficult problem once the Taliban influence was removed from Afghanistan. 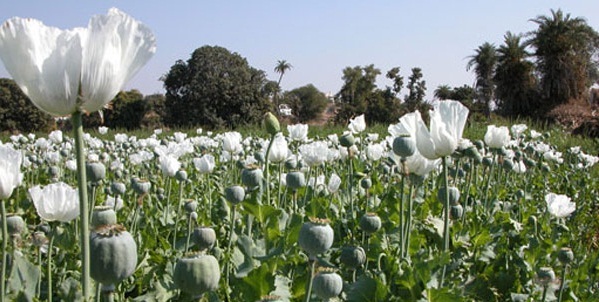 A considerable amount of Taliban funding was derived from the illegal cultivation of Papaver somniferum for Opium or Heroine. Many citizens in areas previously controlled by the Taliban rely on Opium Poppy plants for their income. The chemical Thebaine is what is found in the hair when tested for illegal drugs created from opium. New drugs are being developed that have the potential to treat pain up to 8 times better than Morphine, and the effects of these new painkillers could last up to three days. A new mutated opium plant has been developed to create medicinally useful alkaloids, but the plant do not produce the alkaloid responsible for the production of illegal drugs derived from this plant. All parts of the opium plant contain the alkaloids used to make morphine, and this milky juice is found in most concentration when the young plant first becomes green. To learn some interesting facts about the author and compiler of this page, proceed to the A Little About Me.